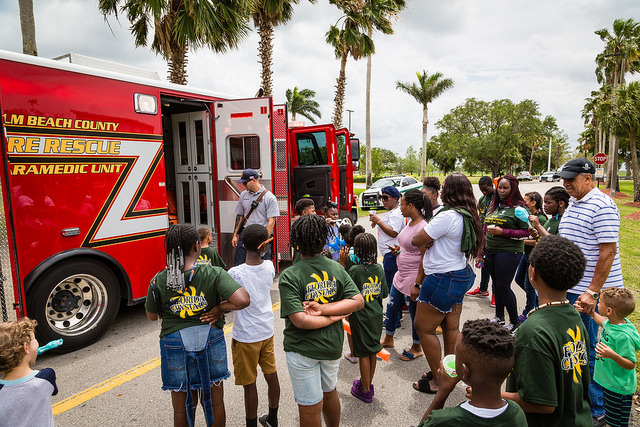 A member of the Palm Beach County Fire Rescue Department speaks to a crowd at the 2018 Belle Glade Family Fun Day. Palm Beach State College’s Belle Glade and Loxahatchee Groves campuses will each hold a Family Fun Day to increase community engagement. The Belle Glade event takes place from noon to 3 p.m. Saturday, Feb. 9 on the lawn in front of the Technical Education Center building and the Loxahatchee Groves event will be from 11 a.m. to 1 p.m. Saturday, Feb. 16 on the patio. The activities are free and open to the public. This is the second annual Family Fun Day for the Belle Glade campus and the first for the Loxahatchee Groves campus. Both events will feature food and music. In addition, the Palm Beach County Fire Department will conduct fire truck tours. There will also be games, face painting and photo opportunities with PBSC’s mascot, Palmer the Panther. Attendees are encouraged to bring their own lawn chairs. There will be an array of community partners with information tables and giveaway items at each event. For more information on the Belle Glade event, email McNeal at mcneall@palmbeachstate.edu or call 561-993-1156. For more information on the Loxahatchee event, contact Christina Seado Vasquez at seadovac@palmbeachstate.edu or call 561-790-9009.